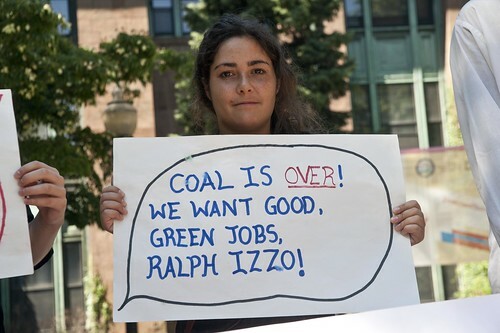 Right now, there are only 5 coal-fired power plants left in New England. Over the last handful of years- there have been signs that all are facing severe challenges to remain economically viable. That transition can’t come fast enough for Bridgeport and Connecticut. Burning coal is one of the dirtiest ways to produce electricity. Soot, smog and ozone from the Bridgeport coal-fired power plant contribute to the failing grade for air quality awarded to Fairfield County by the American Lung Association. The air quality is so bad in Bridgeport, that the State of Connecticut Department of Health found that kids in Bridgeport are ten times more likely to die from asthma attack than kids elsewhere in the state. That’s why Healthy CT Alliance is organizing and working hard for a fair and smooth retirement of the plant for the city and the workers, and redevelopment of the site, is essential for Bridgeport. As a majority low-income and community of color disproportionately burdened with pollution, the Environmental Protection Agency recognize the city of Bridgeport as an Environmental Justice Showcase Community. Historically, the South End neighborhood of Bridgeport was founded and sustained by freed African-Americans. It was a major depot on the Underground Railroad and by the 1850’s was nicknamed “Little Liberia” to reflect its commitment to equal rights for African-Americans. The two remaining homes from that era are on the National Register of Historic Places, and sit in the shadow of the coal-fired power plant. This juxtaposition was recently highlighted by the NAACP’s recent report, “Coal-Blooded” where it recognized the Bridgeport coal-fired power plant as among the top ten worst environmental justice offenders in the nation. The waterfront location of the plant, in the midst of a once thriving community, is a stark and grim testament to the harm it continues to impose to the vitality of Bridgeport’s South End and the health of its residents. This summer Toxics Action Center went door to door to gather support from towns all across Southern Connecticut- and was received warmly by you and your neighbors- and we plan to hold PSEG to their own words here in Connecticut.